Apocalypsis" means to reveal something not known or hidden - to make known a mystery. The Revelation of Jesus is to reveal things previously unknown or not understood about Christ. 1c) things which must shortly take place. The word translated "shortly" is from the Greek word "tachos," which means to happen in rapid succession, or when things are revving up like "birth pangs." Jesus reveals things to us through "signs" and "symbols" in a message through His angel. The angel gives the Revelation to the apostle John whom Jesus suggested would live to see the Lord's return in John 21:20-23 which John does see in his vision of the Revelation. John testified that the Word of God is true in John 21:24. 2b) and to the testimony of Jesus Christ, to all things that he saw. Revelation is the only book in the Bible that promises a special blessing to those who read and keep it. To understand it, you must search the rest of the Scriptures. Those who keep the things written in it usually seek to live holy lives as they watch for the Lord's return. 3b) for the time is near. The time for the fulfillment of these prophecies is imminent. This was a customary Hebrew greeting. This greeting leads into the introduction of the triune Godhead. This title describes the eternal nature of God the Father. The "seven Spirits" before the throne of God is the Holy Spirit who has 7 attributes in (Isaiah 11:1-2). Jesus is the third person of the Godhead introduced to us in the greeting. The name Jesus means salvation and Christ means the anointed one or messiah. A faithful witness does not lie. It is impossible for God to lie (Titus 1:1-2, Hebrews 6:17-18). Jesus is the "first fruits" of our resurrection (1 Corinthians 15:16-23), as He was the first to rise from the dead among the "soul harvest" of men and receive a glorified body. 5d) and the ruler over the kings of the earth. The Lord still has sovereignty over the earth as "King of kings," though He has granted temporary authority to Satan over the kingdoms of this world. The Father manifested His love to us by sacrificing His Son. The Son offered Himself up in sacrifice because of His love for us. The Lord blood atones for our sin, covering it, and purifying us. We are royal heirs as the spouse of the King of kings who will rule and reign with Him. The New Covenant makes us priests, as our bodies are the temples of the Holy Spirit. 6b) to Him be glory and dominion forever and ever. Amen. God does not share His glory and His sovereignty is everlasting. "Behold" means to "perceive" or "look" – Jesus is returning visibly. Jesus will return "with" clouds (the heavenly host), but also in a literal cloud, the same way He ascended to Heaven after He rose from the dead. The glory of the Lord also appears as a cloud. 7b) and every eye will see Him, even they who pierced Him. The inhabitants of the Earth and possibly Hell will witness the return of Jesus visibly. Those who will witness the return of Jesus include the Jews who rejected their Messiah sending Him to the Romans to be crucified. 7c) And all the tribes of the earth will mourn because of Him. The Jews will mourn out of humbleness when they realize that Jesus the Messiah they rejected. Unbelievers will mourn out of guilt when they realize judgment is upon them because they rejected the Lord. "Amen" means "so be it" and is a Hebrew declaration used at the end of benedictions throughout the Old Testament. The Alpha and Omega are the first and last letters of the Greek alphabet. This is another way to say "the beginning and the end" or "the first and the last." This title denotes the Lord's eternal existence and omnipresence. This title describes the eternal nature of Jesus. This is the same title given to God the Father in Revelation 1:4. This title shows describes God's sovereignty or omnipotence - He exercises dominion with unrestricted power. John relates to other believers as both a brother and companion, showing he is a humble servant of Christ. God gives evidence to the world that you belong to His kingdom when you acquire patience through tribulation. 9b) was on the island that is called Patmos for the word of God and for the testimony of Jesus Christ. John tells us he was on Patmos for the "Word of God" and the "testimony of Jesus," so he was probably persecuted and exiled to the Greek island for his faith. The "testimony of Jesus" bears witness that the "Word of God" is true and that we have eternal life through Jesus. Another way to say this is that John "came to be in the Spirit" which alludes to something beyond the indwelling of the Holy Spirit at salvation and our daily walk in the Spirit. John "in the Spirit" might be something more like when Ezekiel was spiritually transported to the valley of dry bones. The "Lord's Day" could refer to the Sabbath, or seventh day of the week. Or, the "Lord's Day" could refer to the first day of the week, which is the day the Lord was resurrected and when the Church began to meet. Or, the "Lord's Day" could refer to the seventh millennium on the earth that begins at the rapture and ends after the thousand year reign of Christ on the earth. In this case, John would have been spiritually transported in time by the Holy Spirit to the eschatological "Day of the Lord." The loud voice like a trumpet is the Lord's voice. 11a) saying, "I am the Alpha and the Omega, the First and the Last"
Jesus introduced Himself in Revelation 1:8 as the "Alpha and Omega" which are the first and last letters of the Greek alphabet. This is another way to say "the beginning and the end" or "the first and the last," the prototype, or firstborn of the dead, and paramount of all that there is. Books during John's time were written on scrolls or tablets. 11c) and send it to the seven churches which are in Asia: to Ephesus, to Smyrna, to Pergamos, to Thyatira, to Sardis, to Philadelphia, and to Laodicea." When John finished recording the events revealed to him, he was to send his account to seven churches in Turkey. The order listed would have been the most efficient route for someone to hand deliver the message. John turns to see who was speaking with the loud trumpet voice and he sees seven golden lampstands. These lampstands represent the seven-fold Holy Spirit working through the seven churches, who feed into one lampstand, or menorah represented by Jesus. Jesus is the base of the menorah with the candlesticks, or churches feeding into it - He is the middle base being in the midst of the seven lampstands. This is the same picture in John 15:5, where Jesus is the vine and the branches represent the body of believers. The Holy Spirit is the source or fuel of the fire (often pictured as oil), but Christ is the Light and gives light to believers. The 10 menorahs in the earthy temple may allude to the ten descriptions John gives of Christ's appearance. This title speaks of Jesus' humanity. Only a sinless human could fulfill the Law and free humanity from the penalty of sin and death. As both the "Son of Man" and "Son of God," Jesus is the only mediator between God the Father and men, and the Father has given the Son authority to judge men. 13c) clothed with a garment down to the feet and girded about the chest with a golden band. The priests in the Old Testament wore corresponding garments and bands/sashes. Being "girded" is a sign of strength. The band symbolizes Israel's dependence on the Lord. Gold represents holiness, purity, and kingship. The hair like wool identifies the Son of Man as also being the "Ancient of Days" in Daniel. Jesus as the Son of Man looked like a normal human, but the Ancient of Days is the Lord in His glorified form. Hair white as snow represents Christ's power to cleanse us from our sin. The Lord's piercing gaze relates to judgment and His displeasure with sin. Daniel describes the Lord's feet as "burnished bronze." Bronze is strengthened when it is purified in fire and pictures judgement and restitution. The utensils and laver used in the earthly temple were used for the atoning sacrifices for sin. The Lord will trodden down His enemies in judgment with his bronze feet. The Lord's voice is like a trumpet, but also like the deafening sound of many waters like a powerful waterfall. The seven stars are the seven angels of the seven churches in Turkey (Revelation 1:20). The "right hand" shows favor and symbolizes strength: protection, and salvation. The Word of God is a sharp two-edged sword that has the power to kill in judgment. Jesus is the personified Word of God who will kill His enemies by the Word of His mouth at the end of the Tribulation. 16c) and His countenance was like the sun shining in its strength. This describes the physical manifestation of the Lord's glory, and like the sun is too bright to behold with our physical eyes. 17a) And when I saw Him, I fell at His feet as dead. John could not behold the Lord in His glory. Falling on one's face is due to human sin that is self-evident before a Holy God. The right hand signifies favor, strength, protection, and salvation. All these things provided by our Savior should give us comfort instead of fear. Our sin nature comes between us and the Holy God. In our sinful state, fear is the natural emotion felt by those who experience the glory of God. Believers should have reverent fear of the Lord, not terror like unbelievers. 17c) I am the First and the Last. We should not have fear because the Lord is eternal. The Lord is also the prototype of our resurrection, being the firstborn of the dead and is omnipresent or paramount of everything finite. We should not have fear because through His death, Jesus claimed victory over death, and over Satan, who once had the power over death. 18b) and behold, I am alive forevermore. Amen. We should not have fear because Jesus conquered death, rising from the dead as the firstfruits of our resurrection. 18c) And I have the keys of Hades and of Death. We should not have fear because Jesus paid the ransom and penalty for our death through His own death. After Jesus rose from the dead He had the power to release the souls from Hades and raise them from the dead. 19) Write the things which you have seen, and the things which are, and the things which will take place after this. God reveals mysteries through the Spirit. The seven stars are the angels of the seven churches (20b). The seven golden lampstands are the seven churches in Turkey (Revelation 1:11). The number "seven" denotes complete perfection. An angel is a messenger either supernatural or human. A star can depict a supernatural being, but it can also represent someone of prestige or nobility. In this case, stars being human make the most sense, both as guardians and respected leaders over the flock, and logistically in delivering the messages. 20c) and the seven lampstands which you saw are the seven churches. This section leads into Revelation 2-3 where Jesus addresses the churches represented by the seven lampstands (Revelation 1:13). While Jesus addressed seven literal first century churches, the application of His message to these churches extends to the Church body at large and there is a spiritual interpretation that encompasses the entire Church history. Address - Jesus addressed the message to the angel or messenger of each church. There are some interesting tie-ins between the history of the city, the meaning of the name of each church, and the message of each letter. Description of Christ - In every message to each church, Jesus cites a different description of Himself that give us clues to the central theme of the letter. 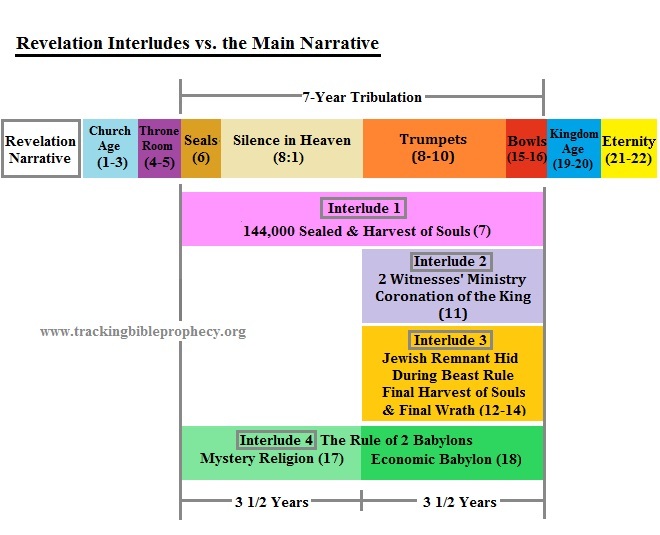 In most cases, these are the same descriptions given of the Lord in Revelation 1. What is known - Jesus opens each message assessing the current condition of each church. Praise - Most of the churches received commendation from the Lord for the works they did for Him. Rebuke - While most of the churches received praise, most were also lacking in their works, or rebelling in what they tolerated or allowed. For those churches that received rebuke, the Lord preached repentance in His counsel. Otherwise, the Lord said He would personally intervene in the affairs of that church judicially. Rather than administering punishment immediately, the Lord in His longsuffering and mercy (Numbers 14:18), gave these churches a chance to repent first. Counsel - For most of the churches, the Lord gave instruction for what needed correction, warning that He would personally intervene if repentance did not occur. For the few churches that receive no rebuke, He admonished them to stay on track. Call to Hear - The Lord gives the same call to every church: "He who has an ear, let him hear what the Spirit says to the churches. The Lord directs the call in the messages to the churches to each believer within each congregation, who have spiritual ears attuned to listen to what the Holy Spirit is trying to teach about the "mysteries of the kingdom." Promise to Overcomers – Overcomers are those who believe that Jesus is the Son of God. Believers will receive all the promises given in the letters to all the churches. Summary and Theme - Every word spoken by the Lord to each church pertains to the condition and behavior of each church. Prophetic Church Age Type - The character of each church has curiously appeared to manifest in the major divisions of the history of the Church, but it is important to stress that this view should not overshadow the clear literal meaning directed toward the first century churches and the Church body at large. Click on phrase to link to relevant commentary. Name meaning "Overseer" or "Guardian" "Myrrh" "All encompassing marriage" Possibly "censor to burn incense" Type of gemstone "Brotherly love" "Rule by the people"
1a) "To the angel of the church of Ephesus write"
The name Ephesus means: "Overseer" or "guardian," possibly derived from the Greek word "ephoros." Paul lived in Ephesus for a few years during his ministry. He became embroiled in a dispute with artisans, whose livelihood depended on selling the statuettes of Artemis in the Temple of Artemis (Acts 19:23-41). Paul wrote 1 Corinthians while he lived in Ephesus and wrote his epistle to the Ephesians while he was in prison in Rome. Jesus is the guardian over the angels of the churches. Jesus first appeared in Revelation 1:13 & 20, in the midst of the lamp stands, or churches, as the "Son of Man." As in the menorah, Jesus is the supporting base to the branches that hold the lamps, which represent the churches, or the assembled believers of Christ. 2a) "I know your works, your labor, your patience"
The Church should labor and do good works as a testimony of their faith. God gives evidence to the world that you belong in the Kingdom, by enduring trial and tribulation, which cultivate patience, or perseverance, and character. 2b) and that you cannot bear those who are evil. Paul admonished the church of Ephesus to avoid fellowship with those who show the "works of darkness" and "expose them" (Ephesians 5:8-11). In other words, the church was not to put up with open sin within the congregation. The Greek word "apostolos" translated "apostles," means "one who is commissioned." The use of the word "apostle" in this context extends beyond the scope of the original twelve chosen by Jesus. Paul defines false apostles as "deceitful workers" who are after personal gain (2 Corinthians 11:4-5, 12-15). Due to deception, believers are to test all things (1 Thessalonians 5:21-22, 1 John 4:1). The Ephesians "persevered," enduring an apparent bombardment of false teachers trying to infiltrate the church. God gives evidence to the world that you belong to His Kingdom when you acquire patience through tribulations (Revelation 1:9). 3b) and have labored for My name's sake and have not become weary. Laboring for the Lord's "name sake" is to minister to other believers (Hebrews 6:10-15). As a show of thanks for our promised inheritance, believers should not grow weary and slack in laboring for the Lord (Colossians 3:23-24, Colossians 1:10-12). 4) Nevertheless I have this against you, that you have left your first love. The Ephesians had apparently became so busy in their works, that their heart turned from serving the Lord, to serving men; they left their "first love" – the sacrificial love for the Lord. Sacrificial love is that which is essential to strengthen a marriage between a husband and wife. This is also the same type of love Christ has given to the Church through His sacrifice on the cross. Paul taught the Ephesians about the love between Christ and the Church, comparing it to the marriage relationship (Ephesians 5). Making the Lord first in priority, by loving Him with all one's "heart, soul and mind" are the "first works." The Lord urged them to repent of their motives and return to serve with "sincerity of heart, as to Christ... and not to men" (Ephesians 6:5, 7) to restore their relationship with the Lord. 5b) or else I will come to you quickly and remove your lampstand from its place - unless you repent. The lamp stand being moved "from its place" means that the church of Ephesus would no longer be used by the Lord. The Greek word "kineo" translated as "remove" can also mean to provoke, or stir. The Lord's counsel would have created quite a "stir" that would hopefully have led the congregation to repentance. 6) But this you have, that you hate the deeds of the Nicolaitans, which I also hate. "Nicolaitan" comes from the Greek words "nikao," a verb which means to conquer, or lord over, and "laos," a noun which means people. Therefore, a "Nicolaitan" would be clergy who rule over the "laity," or body of believers. The "Nicolaitan" movement would have been the beginning of the ecclesiastical hierarchy, which has its roots in the Babylonian pagan priesthood. 7a) "He who has an ear, let him hear what the Spirit says to the churches. The Lord directs the call in the messages to the churches to each believer within each congregation, who have spiritual ears attuned to listen to what the Holy Spirit is trying to teach about the "mysteries of the kingdom." 7b)"To him who overcomes I will give to eat from the tree of life, which is in the midst of the Paradise of God." Overcomers are those who believe that Jesus is the Son of God (1 John 5:4-5). After the fall, God prevented man from eating of the tree of life, so that he would not live in sin forever (Genesis 3:22-24). To eat freely of the tree of life is symbolic of eternal life without sin and the regained access to God through Christ (Romans 5:1-2). The "Paradise of God" was initially in the Garden of Eden. After the fall of man, God moved "Paradise" to the center of the earth. After the cross, when Jesus restored man to God, Jesus took "Paradise" to Heaven. The name Smyrna means: "Myrrh," from the Greek "smurna." Myrrh is a bitter spice that releases a fragrant aroma when crushed. Myrrh was a spice used in embalming the dead. The works of the church at Smyrna relate to enduring persecution, because the Lord promises a reward to them for being faithful to Him even unto death (Revelation 2:10). The "tribulation" that Smyrna was going through led to physical poverty. The guild, or union structure, of Smyrna's economy may have led to persecution of the Christians there. Smyrna was physically poor, but the Lord says they were spiritually rich. 9b) and I know the blasphemy of those who say they are Jews and are not, but are a synagogue of Satan. It is a blasphemy against God for people to call themselves Jews, merely by ancestry, or by trying to keep the Mosaic Law, which has been an impossible task for all but Christ. God only considers those circumcised in the heart that do not resist the Holy Spirit as true Jews. The religious leaders in Jerusalem mandated that anyone that confessed that Jesus was the Messiah were not allowed in the synagogues – their rejection of Christ was satanic in nature (John 8:42-44), thus they were of the "synagogue of Satan." 10a) Do not fear any of those things which you are about to suffer. We should not fear what might happen to us because Jesus paid the penalty for our sin through His death, claimed victory over death and Satan, and rose from the dead to live eternally as the firstfruits of our resurrection. The Christ rejecting Jews, who were of their "father the devil" (John 8:44), were going to throw some of the Christians in Smyrna into prison. God sometimes uses Satan to test us. Testing is a refining process, as in precious metals. The testing of our faith, through trial and tribulation, builds character and produces patience. 10c) and you will have tribulation ten days. 10d) Be faithful until death, and I will give you the crown of life. The "crown of life" is a reward for faithfulness through trial (James 1:12-15). 11a) "He who has an ear, let him hear what the Spirit says to the churches." 11b) He who overcomes shall not be hurt by the second death." There will be two types of resurrections. The "first resurrection" is to eternal life, the second is to eternal death, or the "second death" (Revelation 20:5-6, 10-14). The second death is permanent separation from God and eternal suffering for all those who do not "overcome" (Revelation 21:7-8). The name Pergamos means: "All-encompassing marriage" from the Greek roots, "peri" and "gamos." The name is similar to the Greek word for parchment "pergamene." When the Ptolemies stopped exporting papyrus, the Pergamenes invented a new substance to use in codices, called pergaminus or pergamena (parchment) after the city. The "sharp two-edged sword" here is the Word of God (Revelation 1:16). The church of Pergamos allowed doctrinal errors to seep in. Correct doctrine comes through the reading of the Word of God. 13a) "I know your works, and where you dwell, where Satan's throne is. "Satan's throne" is the center of pagan worship that originated in Babylon. Satan will give this throne to the beast in the Tribulation (Revelation 13:2). The Lord commended the church of Pergamos for their good works of being able to stay true to the Lord and His faith despite the fact they resided near Satan's throne, where polytheism was rampant. 13c) even in the days in which Antipas was My faithful martyr, who was killed among you, where Satan dwells. According to tradition, Antipas was a bishop of Pergamos, ordained by the apostle John. Many believe the pagans martyred Antipas, by burning him to death in a bull shaped bronze altar. The name "Antipas" means "in place of all." Antipas did not live life for himself, but for Christ. He held fast to the name of Christ and did not deny the faith, because Jesus died for all, in our place (2 Corinthians 5:15). 14) But I have a few things against you, because you have there those who hold the doctrine of Balaam, who taught Balak to put a stumbling block before the children of Israel, to eat things sacrificed to idols, and to commit sexual immorality. Balak, the king of Moab, summoned a Midianite prophet by the name of Balaam to curse Israel. After God did not allow Balaam to curse Israel, he devised a plan to corrupt Israel, to try to get God to curse them instead. Balaam had Balak send Moabite women to seduce some of the men of Israel into sexual immorality and idol worship (Numbers 22-25 & 31). While the Church is not under the Mosaic Law (Romans 6:14), we are not to use our liberty to become a stumbling block to others. That is why the early Church leaders warned the flock to stay away from having any part in these pagan practices. The "doctrine of Balaam" in the Church would be that of compromising morals and testimony after the ways of the world. Friendship with the world in God's eyes is a form of adultery (James 4:4). 15) Thus you also have those who hold the doctrine of the Nicolaitans, which thing I hate. The Nicolaitans are likely a movement that initiated the ecclesiastical hierarchy into the Church. This model has roots in the Babylonian pagan priesthood (Revelation 2:6). The Ephesians hated the "deeds of the Nicolaitans," who vied for positions as clergy for dishonest gain, but the church of Pergamos apparently embraced this unscriptural doctrine (1 Peter 5:2-3). Adopting the Babylonian priesthood model goes hand in hand with giving into the doctrine of Balaam; compromise with the ways of the world that lead to sin. 16) Repent, or else I will come to you quickly and will fight against them with the sword of My mouth. Permitting the "doctrine of Balaam," and embracing the "doctrine of the Nicolaitans" within the Church, led to doctrinal errors. Jesus warned the church of Pergamos that if they didn't turn away from their tolerance of such doctrines, that He would "fight against them with the sword of [His] mouth," which is the Word of God. 17a) "He who has an ear, let him hear what the Spirit says to the churches." 17b) To him who overcomes I will give some of the hidden manna to eat. Pergamos tolerated the "doctrine of Balaam," which included eating of food sacrificed to idols, which spiritually compromised their Christian witness. Conversely, Christ offers manna to the overcomers. When the miracle of manna ceased, as Israel entered the Promised Land, Moses commissioned Aaron to take some manna and place it in the Ark of the Covenant hidden" behind the veil, where the high priest entered only once a year. The veil that hid the manna tore in two (Mark 15:38) when Jesus, our High Priest (Hebrews 2:17), died on the cross. He has revealed Himself as the manna that was hidden, the "living bread" that is now available to us. Those who eat of the "bread of life" will never die (John 6:48-51). The color white pictures the cleansing of sin (Revelation 1:14). When the Israelites crossed over the Jordan into the Promised Land, they set up an altar of whitewashed stones, with the words of the Law written on them (Deuteronomy 27:2-3). The Law written on whitewashed stone is the first covenant. Under the new covenant, God will write His Law on the hearts and minds of believers (Hebrews 8:6-7, 10 & 9:15). The white stone then, symbolizes the promised inheritance of the overcomers, bought with the cleansing blood of Christ, who writes His Law on their hearts and minds. 17d) and on the stone a new name written which no one knows except him who receives it. Names in Scripture are rich with meaning. Jerusalem will receive a new name that will describe its restoration to the Lord, in contrast to being forsaken and desolate. Like Jerusalem, overcomers will be remade and receive a new name. The new name will be a secret between the overcomer and God. This is possibly speaking of the special intimate relationship the Lord has with each believer. Part of the enticement behind the Babylonian priesthood was to learn what was "forbidden knowledge" to others, so the reference to "hidden manna" and a "secret name" might be a counter to the hidden and secret practices of those who held to the pagan practices that originated in Babylon. Study of the Word produces sound doctrine. Church tradition says that Thyatira means "odor of affliction," possibly originating from "thymiaterion," which is a censor used to burn incense, and the Greek root word "thuo," which means sacrifice. This title speaks of Jesus' humanity (Revelation 1:13). The Son of God came to destroy the works of the devil (1 John 3:8). Thyatira is under the burden of the "works of the devil." The Lord's piercing gaze relates to judgment and His displeasure with sin (Revelation 1:14). Bronze is also associated with judgment and purification from sin and shows that the Lord is not pleased with the congregation at Thyatira (Revelation 1:15). 19) I know your works, love, service, faith, and your patience; and as for your works, the last are more than the first. The "first work" is to "love the Lord your God with all your heart, with all your soul, with all your mind, and with all your strength (Revelation 2:4-5). Apparently the congregation at Thyatira had put more emphasis on their love and works toward others, allowing it to encroach on their devotion to the Lord, but they were not rebuked for leaving their "first love" like the church of Ephesus (Revelation 2:4). Jezebel was a woman in the church working in the "spirit of Jezebel." Jezebel led the northern kingdom of Israel into sin through Baal worship, a cult involving sexual immorality and idol worship, which is harlotry and witchcraft (2 Kings 9:22). 20b) who calls herself a prophetess, to teach and seduce My servants to commit sexual immorality and eat things sacrificed to idols. Those called a "prophetess" in Scripture were godly women, who were given messages from the Lord in the same way as the men called prophets. It appears that this woman Jezebel had come into the Church under the guise of a prophetess, but used witchcraft to lead astray some of the Lord's servants, or believers (Revelation 1:1), into sexual sin and idolatry, which was the "doctrine of Balaam" (Revelation 2:14). 21) And I gave her time to repent of her sexual immorality, and she did not repent. The woman Jezebel remained rebellious and unrepentant in her sexual immorality which was a physical manifestation of spiritual harlotry. This phrase in the Greek was a figure of speech commonly used that meant "to make one sick." This period of "great tribulation" is not speaking of the last half of the Tribulation described in Matthew 24:21 and Revelation 7:14, but was a time of punishment through sickness for Jezebel and those that committed adultery with her. 22c) unless they repent of their deeds. Sexual immoral believers at Thyatira could have also been spared "great tribulation" and suffering if they had repented of their sin with Jezebel, like King Ahab (1 Kings 21:25-29). Any children conceived in sin by Jezebel at Thyatira, were going to die because of her sin. Though not every child born out of a sexually immoral relationship dies, God may choose to take the life of the child to punish the parent's sin like King David who lost the child born out of his adulterous relationship. 23b) and all the churches shall know that I am He who searches the minds and hearts. The Lord would punish as an example and warning to all the churches of what would happen if they lived in unrepentant sin. The Lord addressed Himself to the church at Thyatira as "the Son of God, who has eyes like a flame of fire." (Revelation 2:18), which relate to His judgment and displeasure with sin (Revelation 1:14). Searching the minds and hearts of men is to look at their motive (Jeremiah 17:10). 23c) And I will give to each one of you according to your works. God will judge the works of everyone, both good and bad (Romans 2:4-11). Unbelievers will be judged at the "Great White Throne Judgment." Believers from the Church Age will be judged before the "Judgment Seat of Christ." Believers in the Tribulation will be rewarded when Jesus returns to set up His Kingdom on Earth (Matthew 16:24-27). The Lord gives counsel to both the angel and "the rest" of the congregation in Thyatira. This may support the argument that the angels of the churches are men (Revelation 1:20). The opposite of the "depths of Satan" would be the "deep things of God" (1 Corinthians 2:7). The Holy Spirit reveals the "deep things of God." Conversely, the "depths of Satan" would be revealed through his demonic devices, in the same way he gives "forbidden knowledge" to those in the Babylonian pagan worship (Revelation 2:17). Jezebel taught the false doctrine of Balaam (Revelation 2:14), which encouraged the sinful activities of sexual immorality and eating food sacrificed to idols. Her rebellion and refusal to repent, was a form of witchcraft, powerful enough to entice believers at Thyatira to follow her false doctrine. 24c) as they say, I will put on you no other burden. A "burden" is the expectation to follow certain items from the Law of Moses. The Law of Moses was a "burden" that was impossible to follow completely. However, that does not mean that there are not items from the Law that Christians would do well to take heed to, as indicated by the apostles (Acts 15:29). If we follow the Lord's commandments to love Him and our neighbor (Mark 12:30-31), staying away from idolatry and sexual immorality is not a "burden" anyway (1 John 5:1-3). 25) But hold fast what you have till I come. While most of the letter to Thyatira was a rebuke from the Lord, Jesus did praise the church encouraging them to "hold fast," or work to maintain the positives things they had - their works, love, service, faith and patience (Revelation 2:19). As the Lord is faithful in His promises, we should strive to be faithful and diligent in doing His works, until death, or the rapture (Ephesians 2:10). Those who overcome will receive the promise to reign with Christ over the nations in the Millennium, as "kings and priests" (Revelation 1:6). The Father bestows power to the Son to rule over the nations with a rod of iron (Psalms 2:7-9). To rule with a rod of iron means that the Lord's rule will be just and punishment will be swift and harsh. Iron symbolizes strength that has the power to destroy (Daniel 2:40). Archeology has shown us that a guild of potters also established a trade in Thyatira. A potter can mold a pot while it is still clay, but when the clay has hardened, the potter has the prerogative to destroy it if not pleased with it (Isaiah 45:9). Those who live in the Millennium will either be molded by the Lord willingly, or be "dashed to pieces," if their hearts are against Him. The morning star appears during the darkest hour of the night, before the day dawns (2 Peter 1:17-19). Overcomers can have confidence in the promises given by the Lord. They are to watch for Him as they would the morning star in the dark of the night (Psalms 130:6). Jesus is the "Bright and Morning Star" (Revelation 22:16). As the morning star appears in the darkest hour of the night, the Lord will return in the darkest moment of human history, at the end of the Tribulation (Mark 13:24-26). 29) "He who has an ear, let him hear what the Spirit says to the churches." Neglect of "first works" leads to sin. The name Sardis is the plural form of the Greek word "sard," which is an orange, red, or brown variety of chalcedony, used as a gemstone. Sardis was advanced in industrial arts, including the manufacture and dyeing of delicate woolen stuffs and carpet, and gold extraction, all of which were sources of great wealth. The Lord administers the seven-fold Spirit of God, who is the Holy Spirit (Revelation 1:4). Jesus is the guardian of the seven stars, who are the angels, or messengers of the churches (Revelation 1:16). A reputation, usually based on fame, honor, or notoriety, is to "have a name." Sardis had a reputation for the works that made them appear "alive," but because they relied on the flesh instead of the Holy Spirit Jesus said they were spiritually dead. Being watchful and praying "in the Spirit," can help prevent the trap of temptation that the flesh is easily subject to (Matthew 26:41, Ephesians 6:18). The seven-fold Holy Spirit has seven eyes that denote His watchfulness over the Earth, through the seven lampstands which represent the seven churches (Revelation 1:13, 5:6, Zechariah 4:1-2, 6, 9-10). 2b) and strengthen the things which remain, that are ready to die, for I have not found your works perfect before God. Fruit can only grow on branches, if the branch abides in the life-giving vine (John 15:4-6). Only through the Holy Spirit are believers able to produce fruitful works, and not dead works that are not perfect. Works done by Sardis were not perfect because they did them in the flesh and not through the Spirit. 3a) Remember therefore how you have received and heard; hold fast and repent. Those who become believers hear the word and then receive it (1 Thessalonians 2:13). Not holding fast to the things we have heard through the Word and the Holy Spirit will cause us to "drift away" in our walk with the Lord (Hebrews 2:1). Jesus called out Sardis for their dying, imperfect works done in the power of their flesh, instead of relying on the power of the Holy Spirit and told them to repent. 3b) Therefore if you will not watch, I will come upon you as a thief, and you will not know what hour I will come upon you. Jesus coming as a thief portrays destruction and judgment particularly on unbelievers, but even to believers if they are not watching for the Lord in the Spirit, and rely on the flesh and drift away, not heeding what they heard from the Word (Hebrews 2:1). 4) You have a few names even in Sardis who have not defiled their garments; and they shall walk with Me in white, for they are worthy. True believers, the overcomers (1 John 5:4-5), will wear white, which represents cleansing from sin (Revelation 3:5). Unbelievers wear defiled garments (Jude 1:22-23). The "few names" in Sardis were true believers who did not have defiled garments. True believers lose their defiled garments upon salvation, as illustrated by Joshua the high priest in the last section (Zechariah 3:1-4). In the Kingdom, overcomers will wear white garments, which represents cleansing from sin (Revelation 4:4, 6:11, 7:9, 19:14). White represents cleansing from sin (Revelation 1:14). Cleansing from sin is possible only by the blood of the Lamb (Revelation 7:13-14). 5b) and I will not blot out his name from the Book of Life; but I will confess his name before My Father and before His angels. God will not blot out the names of overcomers, or believers from the "Book of Life." Those who do not deny Christ before men, He will confess before His Father and the angels (Matthew 10:32-33, Luke 12:8-9). 6) "He who has an ear, let him hear what the Spirit says to the churches." The name Philadelphia: comes from the Greek roots "phileo," which means "I love," and "adelphos," which means "a brother"; together known as "brotherly love." Philadelphia was in the administrative district of Sardis. In AD 17, the city suffered badly in an earthquake, and the emperor Tiberius relieved it of having to pay taxes. In response, the city granted honors to Tiberius. "Holy" means to set apart (Leviticus 20:26). The Lord is "holy" and is also known as the "Holy One" (Isaiah 43:15, 47:4). The Church should strive for holiness because God is holy. He has called us to separate from our "former lusts" (1 Peter 1:13-16). 7c) "He who has the key of David, He who opens and no one shuts, and shuts and no one opens"
As a type of the Lord Jesus Christ, Eliakim was given authority over the house of David, given the "key" that opens and closes access to the king. Likewise, Jesus is the way to the Father, who is also a secure "peg" that the "glory of His Father" has been hung on. (Isaiah 22:15-25). An "open door" is an unhindered opportunity for spreading the Gospel (Colossians 4:3-4, Acts 14:27). Philadelphia's works are further described in the next section. 8b) for you have a little strength, have kept My word, and have not denied My name. Having a "little strength" shows that they relied on the power of Christ instead of their own strength (1 Corinthians 4:9-13, 2 Corinthians 12:9-10). Like the disciples, those who receive and keep the Word of God are those who have accepted Jesus as their Savior. Sanctification, or holiness, comes by the truth of the Word (John 17:6-8, 17). Like the promise to the overcomers of the church of Sardis, those who confess the Lord before men, He will not deny before the Father (Revelation 3:5). 9) Indeed I will make those of the synagogue of Satan, who say they are Jews and are not, but lie - indeed I will make them come and worship before your feet, and to know that I have loved you. Those of the "synagogue of Satan" are those who call themselves Jews, yet deny that Jesus is the Messiah (Revelation 2:9). It is a "lie" for people to call themselves Jews, merely by ancestry, or by trying to keep the Mosaic Law, which has been an impossible task for all but Christ (Acts 15:10). Only those circumcised in the heart, who do not resist the Holy Spirit (Acts 7:51), God considers true Jews (Romans 2:17-29). Someday those of the "synagogue of Satan," who afflicted believers in Christ, will "come and worship before [their] feet." Worship of the Lord "before" the Philadelphia believers is acknowledgment of the Lord's work through them and the love that He has for them. 10) Because you have kept My command to persevere, I also will keep you from the hour of trial which shall come upon the whole world, to test those who dwell on the earth. Perseverance, or patience comes through trial and tribulation (Revelation 1:9). Whether by trial, or tribulation, which builds character, or chastening, intended to correct sin, these are evidence to the world that you are a Christian. Consequently, God will not judge or condemn you with the world (1 Corinthians 11:31-32). The hour of trial coming to the "whole earth" is the Tribulation period. 11a) Behold, I am coming quickly! The Greek word translated "quickly" means swift, speedily, or without delay (Revelation 1:1). When the prophecies begin to happen, they will occur rapidly. The Lord's return described as being quickly, instead of "soon" in this passage, does not negate its imminence. 11b) Hold fast what you have, that no one may take your crown. The Lord rewards believers with crowns at the "Judgment Seat of Christ," based on their works. The crown that seems to best fit Philadelphia is the "crown of life," as they kept the Lord's command to persevere (Revelation 3:10). The Lord promised the church of Smyrna the same crown, as they persevered, but were also "faithful unto death" (Revelation 2:10). Believers should constantly be on guard, as to not allow others to deceive them. Being deceived will result in the loss of rewards (2 John 1:7-8). 12a) He who overcomes, I will make him a pillar in the temple of My God, and he shall go out no more. Pillars are the supporting beams, or poles that help support a structure, such as a temple (Judges 16:26). The two pillars in the temple of God in the Old Testament were given names that fit their purpose. "Jachin" means "he establishes" and "Boaz" means "strength" (2 Chronicles 3:1, 17). While the two pillars in the temple of God were bronze, some pillars in the Old Testament were also made of stone. Peter depicts believers as "living stones" that make up the spiritual house, or temple of God (1 Peter 2:4-5). Hannah's prayer likens the saints as "pillars of the earth," who will inherit the heavenly throne (1 Samuel 2:7-9). While there will still be a temple during the Millennium (Ezekiel 40-48), there will be no physical temple in eternity (Revelation 21:22). The spiritual temple made up of believers will continue into eternity. The Lord "shall go out no more" from the spiritual temple (Revelation 21:3). Since God put His name on the earthly temple (1 Kings 9:3), it makes sense that He will put His name on the spiritual temple, made of believers (Revelation 22:3-4). Putting or writing a name on someone, or something, denotes ownership. God blesses those He has chosen to put His name on (Numbers 6:23-27). Protection is part of this "seal," or "mark" of the Lord (Revelation 7:3-4, 14:1, Ezekiel 9:4-6). Someday all of God's people will be eternally secure from any and all harm (Revelation 21:3-4). 12c) and the name of the city of My God, the New Jerusalem, which comes down out of heaven from My God. God will also write the name of the heavenly city, the New Jerusalem, on believers. Jerusalem (earthly and heavenly), and its inhabitants are one entity bearing one name (Daniel 9:19, Isaiah 62:12, Revelation 21:2). 12d) And I will write on him My new name. Just as overcomers will receive a "new name" (Revelation 2:17), the Lord will also have a "new name." Many believe the Lord's "new name" is the one that will still be concealed when He returns (Revelation 19:11-12). 13) He who has an ear, let him hear what the Spirit says to the churches. 14a) "And to the angel of the church of the Laodiceans write"
The name Laodicea: is derived from the Greek roots "laos," which means "the people," and "dike," which means "justice," or "judicial verdict"; together means "rule by the people." Laodicea, benefiting from its advantageous position on a trade route, became one of the most important and flourishing commercial cities of Asia Minor, in which large money transactions and an extensive trade in black wool were carried on. The place often suffered from earthquakes, especially from the great shock in the reign of Nero (60 AD), in which it was completely destroyed. But the inhabitants declined imperial assistance to rebuild the city and restored it from their own means. The Lord immediately confronts the proclaimed self-sufficient church of Laodicea, appropriately named "rule by the people," with an address that establishes that He is the one in charge. "Amen" means "so be it" (Revelation 1:7). Calling Himself "the Amen" indicates that the Lord and His Word are certain. Jesus is not only a "Faithful and True Witness," but it is impossible for God to lie; His Word is true. (Revelation 1:5). Jesus is the "Beginning and the End" being God, He was present at the beginning of creation (Revelation 1:8). 15) "I know your works, that you are neither cold nor hot. I could wish you were cold or hot." The Greek word "psychros" translated as "cold" can also mean cold-hearted. The Greek word "zestos" translated as "hot" can also mean to have fervent zeal. Jesus desires that people are not indifferent about following Him. Indifference, being neither hot nor cold, is hypocrisy (Matthew 15:7-9, Ezekiel 20:39). 16) So then, because you are lukewarm, and neither cold nor hot, I will vomit you out of My mouth. The church was "lukewarm," being hypocritical like the Pharisees. The Pharisees outwardly followed tradition and ritual, thinking they were righteous through their religious acts, while their hearts proved otherwise (Matthew 23:25-28). With similar imagery, God warned Israel they would be "vomited" out of the land, if they did not follow the Lord (Leviticus 18:25-28). The Israelites did not follow the Lord with their hearts, as they had promised. Therefore, God forced them out of the land into exile (Jeremiah 42:20-22). The city channeled water in through an aqueduct from nearby hot springs. By the time the water arrived to the city, the temperature had cooled to a lukewarm temperature, making an interesting play on words in the Lord's rebuke. After an earthquake destroyed the city around 60AD, the people in Laodicea rebuilt the city without help from Rome. The church of Laodicea had a sense of self-sufficiency and pride because of their wealth and independence, being a "free imperial city" from Rome. The church in Laodicea may have been physically rich and in need of nothing material wise, but spiritually the Lord called them "wretched, miserable, poor, blind and naked." Material wealth has a tendency to cause many to deny the Lord and rely on themselves (Proverbs 30:7-9, Deuteronomy 8:10-17). The Lord counsels the church to "buy" spiritual remedies from Him. Spiritual riches are "bought" by accepting the invitation to come into a covenant relationship with the Lord (Isaiah 55:1-3). It is possible for people to get saved, but lack spiritual riches, if they live carnal, instead of Spirit-led lives, not maturing in their faith (1 Corinthians 3:1-3). Gold can represent holiness and purity, as it retains all of its qualities when refined, or tested in fire (Revelation 1:13). To "buy" gold refined in fire, may mean that believers in the church of Laodicea would have to go through testing, like Smyrna (Revelation 2:9-10), to produce spiritual riches. "Testing" in the Bible relates to the faith of believers (Hebrews 11:17, James 1:3, 1 Peter 1:7, Revelation 2:10). In other words, this "remedy" is for spiritually immature believers, not unbelievers. Shame of nakedness is the result of sin (Genesis 2:25, 3:7-11). God killed an animal to cover Adam and Eve's nakedness, which symbolized the atonement, or covering for their sin (Genesis 3:21). Trying to cover our nakedness on our own, as Adam and Eve tried to do, will leave us still ashamed in God's presence. Only by accepting and believing that Jesus paid the price to cover our sin, will we escape the shame of our nakedness before the Lord (Revelation 3:5). Laodicea was known for their trade of rich black wool, which they used to make garments. In stark contrast, the Lord admonishes the church to "buy" white garments. White represents cleansing from sin (Revelation 1:14). The Lord only promises that the overcomers, the true believers (1 John 5:4-5), will wear white garments (Revelation 3:5). Therefore, members of Laodicea that still needed to "buy" their white garments were not true believers. 18d) and anoint your eyes with eye salve, that you may see. Laodicea was also known for an eye ointment, used to treat astigmatism, made with a local rock ground to a powder. The Lord continues his play on words, to show the spiritual blindness that was prevalent in the church of Laodicea. Believers and unbelievers can be spiritual blind (2 Peter 1:9, Ephesians 4:17-19). In the story about a man blind from birth that Jesus healed, the Pharisees remained spiritually blind to the fact that Jesus was the Messiah. On the other hand, the blind man, whose eyes Jesus anointed, not only gained his physical sight, but he also received salvation and spiritual vision (John 9:6-7, 35-41). 19) As many as I love, I rebuke and chasten. Therefore be zealous and repent. The Lord chastens "every son whom He receives"; these are believers (Hebrews 12:5-8). The Lord does not chasten unbelievers. They will however, suffer the natural consequences of their sin in this age. But ultimately, those who reject Christ He will condemned with the world at the last judgment (1 Corinthians 11:32). The Lord admonishes the believers from Laodicea to repent, which means to turn back from, or change one's mind or attitude. Instead of being lukewarm toward the Lord, He wants believers to instead be zealous, or burn with zeal in their relationship with Him (Deuteronomy 6:5). 20) Behold, I stand at the door and knock. If anyone hears My voice and opens the door, I will come in to him and dine with him, and he with Me. Hearing the Lord's voice is connected with belief and an open heart (Hebrews 3:12-19). Sheep that hear the voice of the Shepherd, open the "door" of their heart, and enter the fold through the "door" of salvation, which is the Lord (John 10:7-9, 26-28). Jesus dined with those who heard His voice to follow Him; even sinners (Matthew 9:9-13). Those who have opened the door of their heart to the Lord, and let Him come in, will dine with Him in the Millennium (Revelation 19:9). 21) To him who overcomes I will grant to sit with Me on My throne, as I also overcame and sat down with My Father on His throne. Because Jesus overcame the world, we can also overcome the world (John 16:33, 1 John 5:5). A throne is a seat of power (Colossians 1:16). The Lord will sit on His throne, exercising His power and glory given by the Father, when He returns after the Tribulation to set up His Kingdom (Matthew 25:31). The Lord will share His authority with overcomers. The Lord has promised "power over the nations" to those who overcome (Revelation 2:26). 22) He who has an ear, let him hear what the Spirit says to the churches. Spirit-led believers can understand the "mysteries of the kingdom of God" (Luke 8:8-10), some of which the Lord includes as promises to the "overcomers" in the letters to the churches in Revelation. Spiritual bankruptcy leads people's hearts away from the Lord. This phrase indicates a transition between the "dispensation of grace" and the "dispensation of judgment." 1b) I looked, and behold, a door standing open in heaven. An open door on earth is the ability to spread the Gospel unhindered (Revelation 3:8), but the open door in heaven is the physical entrance to the Kingdom of God. The door in Heaven is only open to those who are saved through Jesus (John 10:7-9) and closed to those who are not (Luke 13:23-28). 1c) And the first voice which I heard was like a trumpet speaking with me, saying, "Come up here"
1d) "and I will show you things which must take place after this." "In the Spirit" is different from being in-dwelt by the Spirit, where the Holy Spirit resides within the believer, guiding and directing them until the day of redemption (Ephesians 4:30, Revelation 1:10). God transported prophets like John and Ezekiel "in the Spirit," to show them future events. Paul also had a similar experience to John, where he was "caught up" to the "third Heaven," or "Paradise" (2 Corinthians 12:1-4) where the Lord sits on His throne. A throne is a seat of authority. The throne in Heaven is the throne of God, from which He maintains sovereignty over all (Psalms 103:19). God governs from His throne in righteousness and justice (Psalms 9:4-8, 89:14). God not only delivers judgment from His throne, He also extends grace (Hebrews 4:16). 2c) and One sat on the throne. 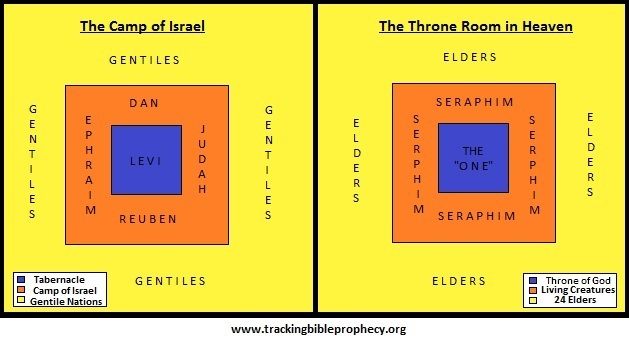 Jesus is the "One" on the throne because He is the only physical manifestation of the Godhead (Revelation 1:14). The stones on the breastplate of judgment worn by the high priest represent the twelve tribes of Israel. The "sardius" and "jasper" stones are the last and the first stones on the breastplate of judgment worn by the high priest. The last and the first sons of Israel were Benjamin, which means "Son of the right hand" (Genesis 35:18), and Reuben, which means "The Lord has looked upon my affliction" (Genesis 29:32). Therefore, the last and first stones on the breastplate of judgment show that the occupant that sits on the throne in Heaven is the "Son of the Right Hand, who was afflicted," or Jesus who called Himself the "First and the Last" (Revelation 1:11). The jasper stone reflects light, appearing as varying colors, in brilliance and sparkle. The sardius stone, also known as the carnelian, is a blood-red color. The sardius and jasper stones together would fit Daniel's description of the throne of God, being a "fiery flame" (Daniel 7:9-10). 3b) and there was a rainbow around the throne, in appearance like an emerald. The rainbow is a sign of the covenant that God made with the earth, that He would never destroy all flesh with a flood again (Genesis 9:13-17). Unlike the earthly rainbow, which includes an array of colors, the rainbow in Heaven appears as hues of an emerald, which is the third stone on the breastplate of judgment of the high priest (Exodus 28:17), representing the tribe of Levi, which means "My husband will be joined unto me" (Genesis 29:34), alluding to the relationship of spiritual oneness between God and His people. The throne of God is a sapphire stone (Ezekiel 1:26-28), which is the fifth stone on the breastplate of judgment of the high priest, representing the tribe of Dan, which means "God has judged" (Genesis 30:6), alluding to the judgment God is about to mete out on the world, in preparation for His Kingdom on Earth. 4) Around the throne were twenty-four thrones, and on the thrones I saw twenty-four elders sitting, clothed in white robes; and they had crowns of gold on their heads. 5a) And from the throne proceeded lightnings, thunderings, and voices. The "lightnings, thunderings and voices," depict the awesome power God has over His creation (Psalms 18:7-14, 77:16-20), and are evidence that God is about to reveal Himself to His chosen people again in the same way that He first revealed Himself to them at Mount Sinai (Exodus 19:16-19). 5b) Seven lamps of fire were burning before the throne, which are the seven Spirits of God. The "seven Spirits of God" are the attributes of the Holy Spirit (Revelation 1:4). The Holy Spirit appeared as cloven tongues of fire at Pentecost, as a sign that the power of the Spirit came upon men (Acts 1:8, 2:1-4). The seven lamps represent the churches, lit though the power of the Holy Spirit (Revelation 1:20). This lit menorah is located "before the throne," but not on the throne, because the Holy Spirit does not have the executive authority that the Father owns and has given to the Son (John 5:26-27). Instead, the Holy Spirit's position is that of "the Helper" (John 14:26), who gives instruction through the "seven spirits," which are the attributes of the Holy Spirit (Revelation 1:4). 6a) Before the throne there was a sea of glass, like crystal. The purpose of the "Sea" in the earthly temple was for the priests to ritually wash before making offerings (2 Chronicles 4:1-6). The "Sea" in the earthly tabernacle was made of bronze, which signifies purification, strength, judgment and restitution (Revelation 1:15). But in Heaven the sea will be clear as crystal, as there will no longer be a need for purification, or restitution, because Jesus has paid the price on the cross. John describes the crystal sea as being like "glass," which portrays a sign of calmness and stability. The martyred Tribulation saints will stand on the sea of glass and it will appear mingled with fire (Revelation 15:2) which are the colors of the jasper and sardius stones - the first and the last stones on the breastplate of judgment worn by the high priest - that point to Christ who is the "first and the last," and the "Son of the Right Hand, who was afflicted" (Revelation 4:3). 6b) And in the midst of the throne, and around the throne, were four living creatures full of eyes in front and in back. The Greek word "zoa" translated as "living creatures" is where we derive our English word zoo from. These living creatures in Heaven take on characteristics like that of earthly creatures (Revelation 4:7), but are of an angelic order (Revelation 4:8). The number four is tied to the earth. 7) The first living creature was like a lion, the second living creature like a calf, the third living creature had a face like a man, and the fourth living creature was like a flying eagle. 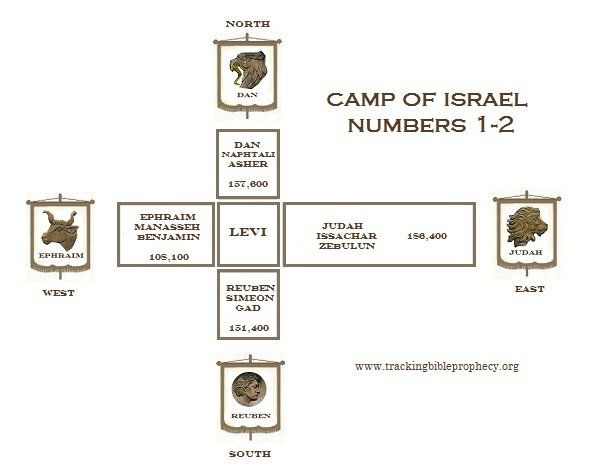 The camp of Israel in the wilderness was divided into four camps, with the Levites camping in the middle. Four tribes: Dan, Judah, Reuben and Ephraim, represented three tribes each (Numbers 2). 8a) The four living creatures, each having six wings, were full of eyes around and within. Isaiah called the four living creatures "seraphim" (Isaiah 6:1-7), which means "fiery," or "burning ones," and this word used elsewhere in Scripture relates to serpents (Numbers 21:6-8, Deuteronomy 8:15, Isaiah 14:29, 30:6). The Lord has commissioned the living creatures to purge evil (Isaiah 6, Revelation 6). The seraphim are guardians around the throne of God, and the cherubim are guardians on Earth below the throne. We are not told why the seraphim are full of eyes. Some believe that the seraphim have spiritual insight into the past, present, and future, with the eyes looking "front and in back" (Revelation 4:6), "around and within" (Revelation 4:8). 8b) And they do not rest day or night, saying: "Holy, holy, holy, Lord God Almighty"
The phrase "holy, holy, holy" is only found in one other passage, again proclaimed by seraphim (Isaiah 6:1-4). "Holy" means to set apart (Leviticus 20:6). The Lord is "holy," and is also known as the "Holy One" (Isaiah 43:15, 47:4, Revelation 3:7). The seraphim, who represent Israel, call out praises both day and night around the throne of God, just as the Psalmist pictures Israel doing: Psalms 22:2-3 - O My God, I cry in the daytime, but You do not hear; and in the night season, and am not silent. But You are holy, enthroned in the praises of Israel. 8c) "who was and is and is to come!" "Who was and is and is to come" denotes the eternal nature of God, being outside of time and is a title used by both the Father and the Son (Revelation 1:4, 1:8). The "One" on the throne is Jesus, who is "alive forevermore" (Revelation 1:18). To give glory, comes with the idea of acknowledging magnificence and splendor, and giving credit where credit is due. Giving honor means to pay respect, or verbally recognize worth. Giving thanks, is to express gratitude to someone for something they did. In Psalms 96, David portrays Israel as giving glory, honor and thanks to the everlasting God, as did the four living creatures around the throne in Heaven. The Greek word translated as "worship" literally means "to kiss towards." It comes with the meaning to pay homage, show devotion, or reverent adoration. Worship is much more than prostrating ones' self on the ground. Other types of worship may include prayer, or music, sacrifice, or giving something to the one receiving the worship like the "firstfruits of the land" (Deuteronomy 26:8-10). Just as Israel gave the Lord back the "firstfruits of the land," the twenty-four elders, representing the Church, will cast their reward, their crown, back to the Lord, in homage for what He did for them and through them. 11) "You are worthy, O Lord, to receive glory and honor and power; for You created all things, and by Your will they exist and were created." The twenty-four elders proclaim that the Lord is worthy to receive "glory, honor and power" because He is the Creator of all. Not only did He create all things, but all things were created for Him. He created all things so that He might have "preeminence," or absolute dominion over all, made possible through His work on the cross (Colossians 1:16-20). 1) And I saw in the right hand of Him who sat on the throne a scroll written inside and on the back, sealed with seven seals. Jesus is the "One" on the throne (Revelation 4:2-3). The right hand, or being at the right side, is a favored position and symbolizes strength, protection and salvation. The scroll being in the right hand shows that it is very significant. (Revelation 1:16). The scroll in has writing on the "inside and on the back." In other words, there is writing on both sides of the parchment. A similar scroll given to Ezekiel was a warning to Israel of impending judgment, if they did not repent. (Ezekiel 2-3). "Sealed" in the Greek means having been closed, or made secure. A sealed document conceals the contents within, until someone breaks the seals. Ezekiel's scroll was not sealed; thus, its contents contained a conditional warning. In contrast, the scroll in Revelation is a sealed document; its contents cannot be revoked, similar to the way the seal of a king's signet ring made pronouncements irreversible (Esther 8:8, Daniel 6:17). When the seals are physically broken on the scroll in Revelation 6, the scroll's contents will take place in real-time. Jeremiah's "purchase deed" is the only other document in Scripture sealed, with writing on both sides. (Jeremiah 32). This "purchase deed" was a document that detailed the ownership of the land. Witnesses signed the deed after sealing it. Therefore, the witnesses' signatures were on the outside of the deed. According to the Mosaic Law, a next of kin was able to redeem the land (Leviticus 25:24-25). Similarly, Adam was given the whole earth to rule over. But after the fall, Adam's dominion and hence the "purchase deed" to the earth was forfeited (Hebrews 2:5-18), but the second Adam – the kinsman redeemer - the Lamb of God has redeemed the world with His blood (Revelation 5:9-10). 2) Then I saw a strong angel proclaiming with a loud voice, "Who is worthy to open the scroll and to loose its seals?" Some speculate that Gabriel is the first strong angel because of his instruction to Daniel to seal up the prophecy given to him (Daniel 8). Gabriel also prophesied of the birth of the Kinsman Redeemer of the sealed scroll (Luke 1:26-38). The strong angel here in Revelation is looking for someone qualified to unseal this prophetic scroll. Identifying who is worthy to open the scroll goes back to the kinsman redeemer - a close relative who can redeem the land (Leviticus 25, Jeremiah 32, Ruth 4). Only a worthy relative of Adam, the original landlord of the earth, can loosen or break the seals of the "purchase deed," and redeem the earth. 3) And no one in heaven or on the earth or under the earth was able to open the scroll, or to look at it. The wording in suggests that no "created" being is worthy to open the scroll. Because man forfeited the "purchase deed" to the earth after sin entered the world, only a sinless relative to Adam can redeem it. All humans are Adam's relatives, but disqualified as kinsmen redeemers because all humans have sinned (Romans 5:12). 4) So I wept much, because no one was found worthy to open and read the scroll, or to look at it. John was weeping because it appeared that there was no one worthy to open the scroll, let alone read it. He understood what was at stake for the earth and the creation. Without a worthy kinsman redeemer, there is no hope. If the creation is not reconciled and restored, God's creation was in vain, and God's sovereignty (preeminence) would be forfeited. (Isaiah 45:18, Colossians 1:16-20). 5) But one of the elders said to me, "Do not weep. Behold, the Lion of the tribe of Judah, the Root of David, has prevailed to open the scroll and to loose its seven seals." One of the elders comforts John, reminding him that there is someone who is worthy to open the scroll. The Messiah, Jesus Christ is the "Lion of the tribe of Judah." Just as a lion is the king of the beasts, Jesus Christ is the "King of kings" from the tribe of Judah (Genesis 49:8-10, Micah 5:2). A "root" is the source of something. In this case, the "root" of Jesus' genealogy is in the line of David. Jesse was David's father. Therefore, Jesus was also the "Root of Jesse" (Isaiah 11:1-5, 10). Being the sinless kinsman redeemer to Adam, Jesus has "prevailed to open the scroll." The Greek word translated "prevailed" means "to conquer or overcome." By sinning, one can succumb to the world. Jesus did not sin, therefore He overcame the world (John 16:33, Romans 5:19, 1 John 5:3-4). After opening the scroll by breaking the seven seals, Jesus will deliver the earthly kingdom to the Father. This will take place after all the contents of the scroll are revealed (Revelation 19-20). Though the elder announced Jesus as the "Lion of the tribe of Judah," John sees a Lamb in the midst of the throne, instead of a lion. The Lamb appears "as though it had been slain." He is alive and standing, yet the scars are still visible. The Greek word translated "lamb" refers to a young sheep. Jesus is the sacrificial lamb foreshadowed in the Passover meal (Exodus 12:3-7, 13, 1 Corinthians 5:7). Peter tells us "with the Lord one day is as a thousand years, and a thousand years as one day (2 Peter 3:8)." The Israelites chose the Passover lamb "four" days before they killed it. Jesus was chosen as the Lamb slain "4,000" years before the crucifixion (1 Peter 1:18-20, Revelation 13:8). Jesus, as the Lamb of God, paid the price for our sins (Isaiah 53:5-7, John 1:29, 1 Peter 1:18-19). Christ covered the cost of the "purchase deed" to the earth with His blood, which He shed on the cross. When Jesus takes back possession of the earth, He will be able to gather all things to Himself, from both Heaven and Earth (Ephesians 1:7-10). "Seven" is the number for perfection, or fullness. This number is replete throughout Revelation. It was through the blowing of seven trumpets of rams' horns, at the leadership of Joshua, that Israel began to take their inheritance (Joshua 6:13-16). In Hebrew, the name "Joshua" is "Yeshua." The Greek for "Yeshua" transliterates to "Jesus" in English. The name "Yeshua" means "He delivers" or "the Lord Is Salvation." Jesus is our "horn of salvation," having redeemed us by His blood (Luke 1:68-69). The Messiah is "the horn of David" (Psalms 132:13-17). A can represent strength, authority, or dominion of a king (Psalms 18:2, 2 Samuel 22:3, 1 Samuel 2:10, Psalm 89:15-17, 20-24, Daniel 7:24). Jesus is the ultimate "Horn," with both the power of salvation and the power to rule over the world. Having "seven" horns shows that He has perfect and complete power. 6c) and seven eyes, which are the seven Spirits of God sent out into all the earth. The seven eyes on the Lamb represent the seven Spirits of God, or the Holy Spirit who has seven attributes (Revelation 1:4). The seven eyes on the Lamb of God show that He has the fullness of the Spirit, as pictured in the baptism of Jesus (John 1:29, 32). The seven Spirits of God are before the throne (Revelation 1:4), in the form of fire (Revelation 4:5). The physical eyes of Jesus looked like a flame of fire in Revelation 1:14, representing His displeasure with sin. The "eyes of the Lord," or the Holy Spirit, seek out intent of the heart of man. The Lord deals with sin, in the interest of those who have a heart for Him (2 Chronicles 16:9). The seven Spirits of God being "sent out," is literally "having been sent out" in the Greek. They went out in the past, as we will see in a moment, and they will also go out in the future, as shown here in Revelation. This demonstrates God's omniscience; nothing is hidden from Him (Hebrews 4:13). The Holy Spirit is not only the "eyes" of the Lord, but also the power through which the Lord operates throughout the earth (Romans 1:3-4, Zechariah 3:8-9, Zechariah 4:6-10). The Holy Spirit appears as fire to the Church and as "eyes" in the Old Testament. During the Church Age, the Holy Spirit works through believers, represented by the lamp stand in Revelation 1:20. A lamp stand bears light, but it is not the source of the light. The "fire" of the Holy Spirit makes the Church "lights in the world" (Philippians 2:13-15). When the light of the Church leaves the world at the rapture, the Holy Spirit will again function in the world as "eyes which scan to and fro" throughout the earth. 7) Then He came and took the scroll out of the right hand of Him who sat on the throne. The Greek word "ek," translated "out of," can also mean "out from." The word "hand" is not in the Greek in this verse, or in Revelation 5:1. Therefore, this verse could be translated: "Then He came and took the scroll out from the right (side) of Him who sat on the throne." The original language gives a little different picture than the translation, in that God is not necessarily holding the scroll out for the taking. Rather the scroll is available for any worthy to take it. Jesus takes the scroll, being the only one worthy to take it. Some object to the thought of Jesus both giving and taking the scroll, and why many assume that the Father is the "One" on the throne (Revelation 4:2) with the scroll. However, the Father is invisible and Jesus is the only physical form of God that there is (Hebrews 1:1-3, Colossians 1:15 & 2:9). The Lord is omnipresent and may be exhibiting this attribute in this passage. 8) Now when He had taken the scroll, the four living creatures and the twenty-four elders fell down before the Lamb, each having a harp, and golden bowls full of incense, which are the prayers of the saints. Harps in the Bible were widely used in worship and in a few instances when men prophesied (1 Samuel 10:5, 1 Chronicles 25:3). David had the power to drive away distressing spirits from Saul when he played his harp (1 Samuel 16:16, 23). It is clear from these examples that music transcends from the physical realm into the spiritual realm. The musically talented Levites who served in the temple were priests who prophesied and worshiped through music (1 Chronicles 25). They were a pattern of the twenty-four elders in Heaven who have harps. Both the twenty-four elders and the four living creatures who represent the Church and Israel are priests before the Lord (Exodus 19:6, 1 Peter 2:4-9, Revelation 1:6, 5:10). Priests the earthly temple were commissioned to burn incense in worship to the Lord (1 Chronicles 23:13). The bowls used in the earthly temple were pure gold (Exodus 25:29). Zechariah saw a similar bowl in his vision (Zechariah 4:2-3, 11-14). In Zechariah's vision, the bowl is the source of the oil feeding the lamps on the lamp stand through the pipes. The bowl is God the Father, the lamp stand with golden pipes and receptacles are Jesus, and the golden oil is the Holy Spirit. The seven lamps or candlesticks represent the Church (Revelation 1:20). The Father gives the Holy Spirit to the Church through His Son, Jesus Christ. The golden bowls are full of incense, which represents the "prayers of the saints." The Holy Spirit makes intercession for us in our prayers, carrying them to the Father (Romans 8:26-27). The prayers of incense are prayers for justice and judgment on the wicked (Psalms 141:1-5, Revelation 8:2-6). The elders and living creatures worship the Lord with praise and prayer because someone was found worthy to open the "purchase deed" of the earth. Since the Kinsmen Redeemer came to claim the "purchase deed," He will be able to rule and reign in justice and righteousness over it. The elders and living creatures together represent redeemed man from the beginning of time to the rapture (Revelation 4). The saints sing a song about man's redemption, in worship to the Lord. The song is new, because before this moment it had not been sung and could not be sung, since the Redeemer had not yet taken the scroll. This song of redemption sung by the elders and living creatures, explains why the Lord is worthy to take the "purchase deed" and break its seals. The Lord's sacrifice paid the price. The saints, represented by the elders and living creatures come from "every tribe and tongue and people and nation." The divisions of family, language, race, and country, show that the Lord's redemption price is for all humans. 10) and have made us kings and priests to our God; and we shall reign on the earth." The elders and living creatures who represent Israel and the Church (Revelation 4) continue singing their "new song." God said Israel would be a kingdom of priests, if they followed the Lord (Exodus 19:5-6). God has made the Church kings and priests (Revelation 1:6). Being a priest in the new covenant means that we minister to God by offering spiritual sacrifices (2 Corinthians 3:6), not blood sacrifices as required in the old covenant (1 Peter 2:4-5, 9). As the Bride of Christ, the Church is royal heir of the Lord's earthly kingdom. The Old Testament saints "are exalted" and will join the Church on the throne (Job 36:7, 1 Samuel 2:8-9) and reign with Christ over His earthly kingdom. Through the redemption process (Leviticus 25), the Lord will restore man's dominion over the earth that Adam forfeited at the fall. Those who survive the Tribulation will live on into the Kingdom in their mortal bodies under the dominion of the resurrected saints. After the elders and living creatures finish their song of redemption, John hears the voice of angels. The angels encompass the throne of God, around the living creatures and the elders. There are too many angels to number. The Greek word "murias," translated as "ten thousand," generally has the meaning of a myriad or an innumerable count (Luke 12:1, Acts 21:20, Hebrews 12:22). 12) saying with a loud voice: "Worthy is the Lamb who was slain to receive power and riches and wisdom, and strength and honor and glory and blessing!" The angels join the elders and living creatures in worship of the Lord. It appears that they are shouting out to the Lord in praise, but not in song. In fact, there is little evidence in Scripture that indicates angels sing at all. If angels don't sing, perhaps the ability to sing is a special gift God gives to the redeemed and their celestial representatives. This is the only passage that lists these seven items together. The passages below, each containing several of these things, further explain why the Lord is worthy to receive them. - The Lord is worthy to receive these things because He created all things (Revelation 4:11). - All things come from the Lord, therefore they are rightfully His (1 Chronicles 29:10-13). - The "Lamb that was slain" is worthy of these things because He made salvation possible through His sacrifice (Revelation 7:10-12). 13) And every creature which is in heaven and on the earth and under the earth and such as are in the sea, and all that are in them, I heard saying: "Blessing and honor and glory and power be to Him who sits on the throne, and to the Lamb, forever and ever!" John hears praises to the Lord from beyond the throne, coming from Heaven and Earth. The concluding verse of the following Psalm encapsulates this radiating praise: Psalms 150:6 - Let everything that has breath praise the LORD. Praise the LORD! Ultimately there will come a day when every created being will worship the Lord (Philippians 2:5-11). The phrase "every creature" in the Greek can mean "all," "the whole," or "every kind of." With this in mind, it may make more sense to translate verse 13 this way: "And every kind of creature," instead of "every creature." It is generally thought that "every knee will bow" and "every tongue confess" that Jesus is Lord (Philippians 2:10-11) will ultimately be fulfilled at the "Great White Throne Judgment" (Revelation 20:11-15). Those who reject Christ will have to acknowledge Him as Lord, when they bow down in worship before Him on judgment day. But because of their rejection, those "under the earth" are not included among those who the Lord will redeem and reconcile (Colossians 1:16-20). That said, men on earth will acknowledge "the Lamb," at the beginning of the Tribulation (Revelation 6:16). I believe that the purpose for this moment of worship is for the creation to pay homage to the Creator, as it should (Psalms 148:1-14). We are again shown two aspects of Christ: "Him who sits on the throne," exhibiting His sovereign power, and the sacrificial "Lamb." Jesus is the only visible form of God there is (Hebrews 1:1-3, Colossians 1:15, 2:9). Therefore, the two forms seen by John are both Jesus, which demonstrates God's omnipresence, while showing us two characteristics of Him. 14) Then the four living creatures said, "Amen!" And the twenty-four elders fell down and worshiped Him who lives forever and ever. The elders fall down in worship in response to the verbal praise by the living creatures as they did in Revelation 4:9-10. In Revelation 1:18, Jesus tells us that He is "alive forevermore." Our eternal life depends on His victory over death (1 Corinthians 15:16-22, Romans 6:5-10). In conclusion to this chapter, it is important to understand where we are in the order of prophetic events. The Church Age is over. The redeemed Old Testament saints and the Church are in Heaven around the throne. The Lord, as Kinsman Redeemer, has just taken the "purchase deed" to the earth. In Revelation 6, the Lord breaks the Seals to open the "purchase deed." When all the events contained within the "purchase deed" transpire on the earth, the Lord will come to reclaim what is His. In preparation for the Kingdom, the judgments enclosed in the "purchase deed" must come to pass before Christ returns. In the process, God will evict the rebellious inhabitants and destroy them. The Jewish people will play an important role in this earthly kingdom (Zechariah 8). However, God must deal with Israel's rejection of Jesus as the Messiah. Through the Tribulation, Israel as a nation will come to accept Jesus as their Messiah. God will turn back to His people and they will turn back to Him (Zechariah 13:9).